The powerful, effective and intelligent spam filtering tool will prevent spam. and blocks the rest of Spam for manually checking. DeSofto SpamFilter automatically checks incoming messages and filters unwanted, dangerous, or offensive mail messages which results in saving your time as you don't have to manually detect and organize mail messages. DeSofto SpamFilter uses unique neuro-algorithm to detect legitimate and Spam mail messages (filter spam). This technique has much more precision comparing to other filter-based and keyword-based anti-spam technologies. DeSofto SpamFilter doesn't confirm a Spam message (detect spam) by a single keyword in the mail contents. It examines the entire message - source, headers and mail contents to confirm whether it is a Spam message or not. DeSofto SpamFilter places all intercepted Spam messages to its internal mail database so that your inbox remains uncluttered and free of Spam. If a legitimate email is flagged as Spam for some reason, you can easily recover it and the message will be automatically received next time you check your mail. You don't need to enter any block-rules. Just install SpamFilter, run and... it's all! Also, you can turn on the second option and SpamFilter will ask you to kill messages that are seems to be a Spam. After the message has been received, SpamFilter check it's body. If the message is "normal", it immediatelly passed to your mail-program. Other (Spam and "seems to be a Spam") messages are blocking for manually checking. All of these messages are ranked. So, you always see messages that needs more attention (they are marked with a color). 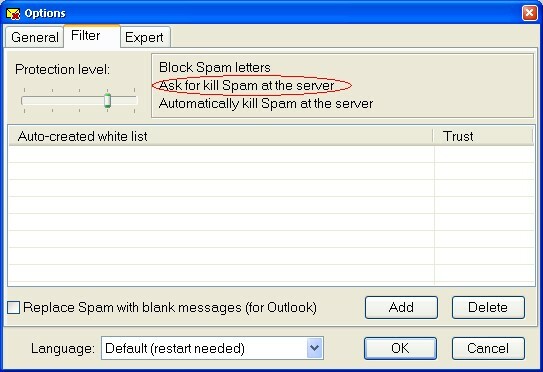 When you receiving messages, SpamFilter remember senders and skip server-side checking for messages from your friends. Only full body-checking works in this case. SpamFilter works as a pop3-proxy server. So, it does not check your accounts separately from your mail-program, but it check every message that your mail-program receiving. Neuro-algorithm works like your brain when checking the message. 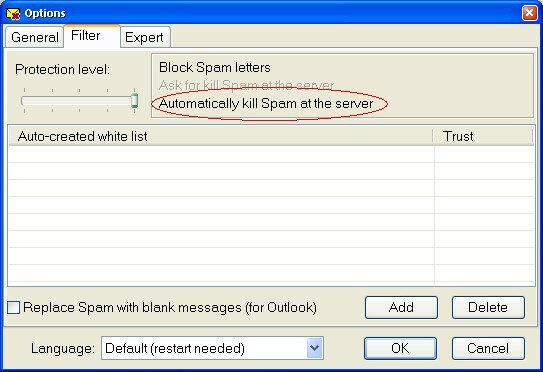 So, any spammer does not deceive SpamFilter because it (SpamFilter) will learn on your own messages to sort Spam messages and normal.